I had the good fortune of seeing The Devil and Daniel Webster for the first time this week. I resisted watching this movie for a long time, and eventually came around to it almost out of obligation - first, because of its place in the Criterion Collection, and second, once a movie gets mentioned by enough people whose tastes you admire, its place in the cannon rises considerably. The classic story of a man, (here, Jabez Stone, played by James Craig) who sells his soul to the devil (portrayed by Walter Huston) for fame and fortune but eventually finds despair never much appealed to me, for reasons I'll get into later, but...wow...I'm glad I took the plunge on this one. The Devil and Daniel Webster had a wild ride from its initial success - critically, though not commercially - to near-obscurity. It was originally released under the title All That Money Can Buy not only to remove the word "devil" (which didn't play well in the South), but also to distinguish itself from The Devil and Miss Jones, which had been released that same year (and is one I highly recommend). Over the next ten years it was known by several names, from Mr. Scratch to A Certain Mr. Scratch to Here is a Man. One could have missed its running at a local theater and never known it. In 1952, it landed on a semi-permanent name through a re-release that removed over twenty minutes and several key scenes. 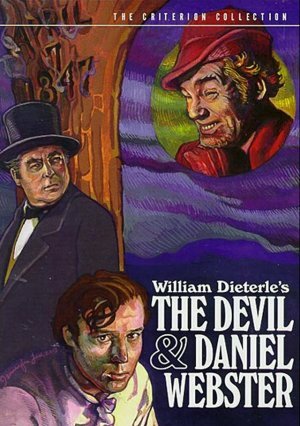 Daniel and the Devil reportedly shrunk both the Devil and Daniel Webster's roles in the film, and nearly decimated the film's most striking tonal achievements. That version was thought to be the only one in existence until 1990, when a full-length 16mm print was discovered, which has since become the basis for future releases. Though The Devil and Daniel Webster seemed a near-afterthought for its studio, RKO, in the years following its release, the opposite could not possibly have been more true during its production. The cinema of the 1930s, with the invention of sound, was characterized largely by people in rooms talking, and it would take a decade before filmmakers were able to capitalize on the visual freedoms their silent counterparts had enjoyed, and it took directors such as William Dieterle to do it. With The Devil and Daniel Webster, I would Dieterle did as much for sound film as Orson Welles had the same year (and at the same studio) with Citizen Kane. In parts, the editing (under the guidance of Robert Wise, also fresh off Kane), is shockingly aggressive and experimental, giving us a visceral window into Jabez's uneven hold on reality, sanity, reason, and his very soul. Other times, Dieterle is wonderfully patient, allowing tension to build within a space while his camera simply takes it all in. Meanwhile, Bernard Hermann's Academy Award-winning score (his only Oscar, competing against his own work in Kane no less) dances along, itself teetering on the brink of insanity and the edge of damnation. The whole film is remarkably free-wheeling cinema that seems to be the successor of the silent era (especially in abandoning reality in favor of symbolism and fantasy) while still capitalizing on sound's innovations. But what I like best about the film is how it treats Jabez's plight. The classic Faustian set-up runs one of two ways. One is that the Devil tricks the protagonist into a raw deal, wherein your success comes only at a great cost to someone you love, or something along those lines. The original short story upon which the film is based takes the second tact - Jabez's only plight is that eventually the Devil comes to collect. In the intervening time, he only gets more successful and more popular. That whole time is pretty much skimmed over as "and things went well." Both of these scenarios let the audience off the hook. We can recognize some sort of basic moral, but in the end simply say, "well, if the Devil ever came to MY door, I'd turn him away (but good thing that will never happen)." In this film, it's a different story altogether. While Jabez initially takes joy in his prosperity, and has no hesitation in sharing it with others, he soon gives over completely into a materialistic lifestyle, giving no regard to those who used to be his friends. When the Devil sends a temptress (played by the ever-captivating Simone Simon), he wastes little time before making her his mistress. His deal with the Devil plays out exactly as planned, and everything bad that happens from there on out is entirely his doing. And so the classic deal with the Devil story becomes something more than a cautionary religious tale - it becomes a tale of one's moral responsibility as a member of a society. Sure, it leans a little heavy on the idea that riches spoil a man, but it still allows for the possibility that good could have come of his wealth, if only he hadn't allowed his good fortune to give way to greed. All of the conflict of the story is rooted firmly in Jabez, and his moral weakness, so rather than the audience saying "oh, that darned Devil," we can see something of ourselves in that, something of the world around us, in which the wealthy do everything they can to keep the money on their side of the table. It's a much more interesting take on the Faust tale, made all the better by Dieterle's supreme command of his craft. I've yet to see the film on Criterion's DVD, but the monochrome HD transfer on Criterion's Hulu channel is magnificent. The black levels, perhaps, are not as deep and abyss-y as one would like in certain shots, and there are some digital artifacts (compressions, etc. ), but most of the time it felt a lot like watching an actual print. I was amazed to find out that a 16mm print has provided the basis for parts of this film (a better, 35mm version of the short version was used where possible, and the splicing between the two versions might account for the varying quality). It's as beautiful and clean a black-and-white presentation of such an old film (70 this year!) as I've seen from a streaming service. The audio fares a little worse - there's a constant hiss throughout - but the dialogue is clear and Bernard Hermann's score is thundering. I eventually had to turn it down to spare the neighbors, but I loved soaking in the noise. This is a different sort of thing that I really love from Criterion's Hulu channel. It presents an upgrade of one of their classic titles (the DVD was released in 2003), free perhaps from the bells and whistles of a Blu-Ray perhaps, but no less satisfying. I don't know if the HD presentation indicates a future Blu-Ray release, but for now, it's great to have available.